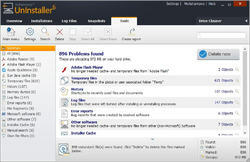 Get rid of unwanted software instantly at the click of a button! 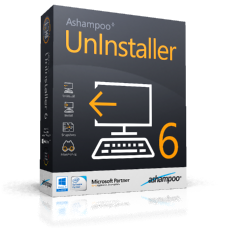 Ashampoo Uninstaller 6 was available as a giveaway on June 5, 2018! Install, try out and uninstall applications without worry. Experience the most extensive installation monitoring technology to date and remove applications without a trace. The newly developed snapshotting technology enables you to trace system modifications with great speed and incredible attention to detail. And don't forget system maintenance: Numerous integrated maintenance tools will help keep your system lean and fast. How would you improve Ashampoo Uninstaller 6? Another great Ashampoo S/W. Regisered swiftly: Reg. key shown on the page soon after running "setup", when "Get activation key" is clicked and details entered. After 1st install, one does not even need to be online for more installations. Efficient! Some people complain about possible SPAM emails from ASHAMPOO, but the Ashampoo License owner can go into their account settings and OPT-OUT of supposed nuisance emails. I bought a lifetime license for it back when version 10 was still shareware, but the company behind Advanced Uninstaller Pro "INNOVATiVE SOLUTiONS" "innovative-sol dot com"continues to develop the program and it is now up to version 12.2x. They do also offer some different PAiD software, which no doubt helps to fund their Uninstaller improvements. With Adv Un Pro you start the program BEFORE beginning the installation of other software and it watches the entire installation process. I do also own paid Revo Pro & Revo Pro Portable programs and Yes the Revo program does have a good hunter scanner looking for orphan registry entries, but it still doesn't remove ALL registry entries that a program may place anywhere in the WiNDOWS registry. REVO have already announced that Version 4 is coming and SADLY they've confirmed that means PAYiNG for UPGRADE LiCENSES from Version 3.x to Version 4.x. One of the drawbacks to ASHAMPOO programs is that owners have to PAY for MAJOR UPGRADES [as opposed to MiNOR UPDATES]. They also occasionally have sponsored programs and that can sometimes prove to be a real "catch". TO MY KNOWLEDGE no current uninstaller will help you to get-around expired program lock-outs if that's what you're hoping to use it for. You'll need to look elsewhere for different programs to do that sort of thing. DiSCLAiMER: I have NO Professional or Paid Associations with any of the companies mentioned above, other than, I have purchased and occasionally use their software products. Thanks for reading the above contents. <b>ASHAMPOO programs are GOOD</b>. Some people complain about possible SPAM emails from ASHAMPOO, but the Ashampoo License owner can go into their account settings and OPT-OUT of supposed nuisance emails. As a PAiD owner of more than 5 ASHAMPOO programs, I'd like to suggest that GOTD User's can look to the following alternative - now free, uninstaller program: <b>Advanced Uninstaller PRO</b> which is FREEWARE I bought a lifetime license for it back when version 10 was still shareware, but the company behind Advanced Uninstaller Pro "INNOVATiVE SOLUTiONS" "innovative-sol dot com"<u>continues to develop the program</u> and it is now up to version 12.2x. They do also offer some different PAiD software, which no doubt helps to fund their Uninstaller improvements. With Adv Un Pro you start the program BEFORE beginning the installation of other software and it watches the entire installation process. I do also own paid Revo Pro & Revo Pro Portable programs and Yes the Revo program does have a good hunter scanner looking for orphan registry entries, but it still doesn't remove ALL registry entries that a program may place anywhere in the WiNDOWS registry. REVO <i>have already announced that Version 4 is coming and SADLY they've confirmed that means PAYiNG for UPGRADE LiCENSES from Version 3.x to Version 4.</i>x. <b>One of the drawbacks to ASHAMPOO programs is that owners have to PAY for MAJOR UPGRADES</b> [as opposed to MiNOR UPDATES]. They also occasionally have sponsored programs and that can sometimes prove to be a real "catch". . TO MY KNOWLEDGE no current uninstaller will help you to get-around expired program lock-outs if that's what you're hoping to use it for. You'll need to look elsewhere for different programs to do that sort of thing. . <b>DiSCLAiMER:</b> I have NO Professional or Paid Associations with any of the companies mentioned above, other than, I have purchased and occasionally use their software products. Thanks for reading the above contents. As an autorun program, which seems to be a disk defragger. I certainly don't want anything silently messing with the disk not under my control. This installs: C:\PROGRAM FILES (X86)\Ashampoo\ASHAMPOO UNINSTALLER 6\DfSdkS64.exe As an autorun program, which seems to be a disk defragger. I certainly don't want anything silently messing with the disk not under my control. Guys? The executable file for the shortcut is "Ashampoo UnInstaller 6\UI6.exe". If you go in the "Tools" tab there is "System Maintenance" menu that offers a defrag option. I am guessing that is what triggers the file you mentioned. However, I am not sure what you see that makes it an autorun program. What tells you that? JohnL, The executable file for the shortcut is "Ashampoo UnInstaller 6\UI6.exe". If you go in the "Tools" tab there is "System Maintenance" menu that offers a defrag option. I am guessing that is what triggers the file you mentioned. However, I am not sure what you see that makes it an autorun program. What tells you that? jboy, I run WinPatrol which reports all new AutoRun programs and offers the option of blocking their addition. Note it was added by the installer, I hadn't run UI6 at that point. I am still very curious what you are looking at that is telling you the defrag file is autorun. Just thought of something, I use Anvir Task Mgr and just checked new files added to StartUp. There were 2 for Ashampoo ; backupService-ab.exe and backupclient-ab.exe. I am still very curious what you are looking at that is telling you the defrag file is autorun. jboy, Looking at the logs the installer seems to have installed it as a Service and Started it. Do you have a "Defragmentation Service" amongst your services now? jboy, Might be completely innocent, it's just I'd rather it wasn't a hidden thing and unrelated to the stated purpose of the program. Yes, I agree. I have quite a few of Ashampoo's software and though it may be innocent, in these times of security being such an issue, it just makes it seem somewhat shady. I stopped it and will check to see if it starts on next bootup. Thanks for getting back and sharing all the info. I'm going to check out that WinPatrol. JohnL, Yes, I agree. I have quite a few of Ashampoo's software and though it may be innocent, in these times of security being such an issue, it just makes it seem somewhat shady. I stopped it and will check to see if it starts on next bootup. Thanks for getting back and sharing all the info. I'm going to check out that WinPatrol. Actually the program has several other integrated tools, which you can optionally use, though the main one is uninstalling. This is not unique to this program. JohnL, Actually the program has several other integrated tools, which you can optionally use, though the main one is uninstalling. This is not unique to this program. xprt007, That's okay as long as they don't do anything to my system when the program isn't running. Installing a new service without asking or saying what it does the rest of the time isn't okay with me. If the software were well written, there would be no need for these utility programs! He needs to know what he has changed, registered, etc. If the software were well written, there would be no need for these utility programs! He needs to know what he has changed, registered, etc. Marks, you are right, but . . not all program's have good de-installers. Once I had to uninstall a printer program and there were about 100 files left and about 1000 registry-entries, found by an uninstall-program. Almost 90% of the program's does not un-install properly. Marks, you are right, but . . not all program's have good de-installers. Once I had to uninstall a printer program and there were about 100 files left and about 1000 registry-entries, found by an uninstall-program. Almost 90% of the program's does not un-install properly. Ootje, Thank you for your comment. However, it is a regrettable fact that many program developers do not pay enough attention to the fair removal of your program! It's as if they're offended because they're not using their program, maybe later. Since I'm not a PC guru, I expect from software developers that if you've ever made a mistake while installing (Win 10), let it go after the 'bitter' exit as it did! I know this is GREAT expectation! P.s . : I've written programs in DOS (Anno assembly language), sometimes MASM32 windows, for private use only, I always know what the 500-4000 rows (+ my collection of macros) are doing. Thank you for watching me and my entry! Ootje, Thank you for your comment. I guess we agree! However, it is a regrettable fact that many program developers do not pay enough attention to the fair removal of your program! It's as if they're offended because they're not using their program, maybe later. Since I'm not a PC guru, I expect from software developers that if you've ever made a mistake while installing (Win 10), let it go after the 'bitter' exit as it did! I know this is GREAT expectation! P.s . : I've written programs in DOS (Anno assembly language), sometimes MASM32 windows, for private use only, I always know what the 500-4000 rows (+ my collection of macros) are doing. Thank you for watching me and my entry! Hi there! Ootje, ....Almost 90% of the program's does not un-install properly......They must be removed manually. Especially when it comes from IObit. Some remains are also removed after a restart of the PC. If there is still something left behind, so be it. I do not care about that. Ootje, ....Almost 90% of the program's does not un-install properly......They must be removed manually. Especially when it comes from IObit. Some remains are also removed after a restart of the PC. If there is still something left behind, so be it. I do not care about that. https://www.martau.com/ Total Uninstall make snapshot before and after.This is most wanted uninstaller. Since I do not want to install too many programs in my computer, will someone with actual experience tell me if this offer -Ashampoo UNinstaller 6 is better or equal or below iObit uninstaller? Sorry to see you are getting some down votes. It seems there are some quite unreasonable people about in this world sometimes. I'm sure many people find your question quite sensible. I have used both installers many times in the past and it is my opinion that iObit is the better one. Infact I now use the free version of the iObit one and this has never given me any problems at all. I like its ability to search for all the remanent file entries and registry entries and give you the opportunity to review them before final deletion. Personally I would stick to that one. drvajra, Sorry to see you are getting some down votes. It seems there are some quite unreasonable people about in this world sometimes. I'm sure many people find your question quite sensible. I have used both installers many times in the past and it is my opinion that iObit is the better one. Infact I now use the free version of the iObit one and this has never given me any problems at all. I like its ability to search for all the remanent file entries and registry entries and give you the opportunity to review them before final deletion. Personally I would stick to that one. Dudley, Thank you so much! Have a great day. drvajra, If you use a windows pc (win10 OS with Edge say/though most OS is same procedure), then there is no need to buy any uninstaller. With an added measure, your Add/Remove utility program is good enough. This is what I do to remove all trace of any program: First, use the Add/Remove program in windows to remove the program (or if you prefer, and also if the program/software to be removed has its own removal exec...then you can use that). After that, depending on the program, there still may be traces of it remaining. Here is what to do to remove all traces. For win10 Edge (or whatever way to finding C drive in Win OS ) type 'this pc' in bottom left search box of pc. Find your C drive. Left click on it to open. Type the name of program you want to remove all trace of at top right search box. PC will search for all file traces. Just keep deleting and searching until they are all gone. Done! Note: You may need to empty recycle bin and then restart...if the same file keeps showing up after you deleted it. This method actually works better than any uninstaller program! Optional: I also use ccleaner (basic program is free) to tidy things up afterwards. What you have detailed, seems time consuming and a lot of work. The purpose of these uninstall programs is to save you from having to put in all that effort. Interesting read though, thanks, I enjoyed it. Rawbl, What you have detailed, seems time consuming and a lot of work. The purpose of these uninstall programs is to save you from having to put in all that effort. Interesting read though, thanks, I enjoyed it. Rawbl, Basically what you are doing is doing what a good uninstaller does. And by using CCleaner after, you are not just using Win 10's uninstall. Most good PC sites will even tell you that Windows Uninstaller is a basic mess, leaving fragments of a program strewn across the computer. Case in point, I installed a lengthy program to test 2 uninstallers. I first used Win 10 uninstaller and did just as you said, checking the PC. I then ran another uninstaller, and it found 3 registry entries and a few other fragments. So while your method works, an aftermarket company uninstaller works better. Even a few Microsoft geek friends agree. I stick with RevoUninstaller Pro anyday sure it cost a little but its worth every penny and no offence to Ashampoo is far better than it. But ty GOTD for the free offer see you tomorrow. I stick with RevoUninstaller Pro anyday sure it cost a little but its worth every penny and no offence to Ashampoo is far better than it. But ty GOTD for the free offer see you tomorrow. Wipeout, It is 1 thing to come in and brag about another companies product, but it is another to show folks why you think Revo is far better. Personally..I have used Revo and iObit uninstallers, and using iObit Forced Uninstall did not cripple my system like Revo force uninstall did. Now that I have 2 versions of Ashampoo Uninstaller, 2017 and Uninstaller 6, down the road, I can compare them to iObit. DJ, Hmm I used iObit and Ashampoo and what you described never happen to me i saved computers with problems using Revo Force Uninstaller that the 2 others couldn't and it saved several clients PC's for me so for my experince Revo is better. I didn't brag I came to say thanks for the offer and why I wasn't taking it but hey just because you seem to not use Revo correctly is not my fault. DJ, Hmm I used iObit and Ashampoo and what you described never happen to me i saved computers with problems using Revo Force Uninstaller that the 2 others couldn't and it saved several clients PC's for me so for my experince Revo is better. I didn't brag I came to say thanks for the offer and why I wasn't taking it but hey just because you seem to not use Revo correctly is not my fault. Wipeout, In a way, you just bragged about Revo again. But hey, if you want to continue using it, by all means do so. As I said, I used Revo and it crippled the system by removing a few much needed, by other programs, entries. So I won't take any chances with customers PC's with Revo. DJ, Hmm well I do know their Force Uninstaller requires you use the correct one, but no if I wanted to brag trust me you know, but again you had a bad experince and won't touch it and thats fine, where I had bad ones with the ones you use very very bad onces and more than one and so does many of the people I know hence why we use Revo, which is fine. I mean I know people who will not touch Intel CPU's due to bad experinces and others who says the same with AMD and yet I use both never had problems with either brand. DJ, Hmm well I do know their Force Uninstaller requires you use the correct one, but no if I wanted to brag trust me you know, but again you had a bad experince and won't touch it and thats fine, where I had bad ones with the ones you use very very bad onces and more than one and so does many of the people I know hence why we use Revo, which is fine. I mean I know people who will not touch Intel CPU's due to bad experinces and others who says the same with AMD and yet I use both never had problems with either brand. I just installed UnInstaller 6 and it has the exact same version number as Uninstaller 2017 that was given away from GotD last time. Very nice illusion. Installing new software also resets your e-mail preferences with them if you previously registered. Not sure about "Uninstaller 2017", but I know for sure is that with other Ashampoo software like let me say Ashampoo Snap 8 or 7, compared to those with the year appended like Ashampoo Snap 2017 or 2018, Ashampoo Snap 8 or Ashampoo Uninstaller 6, etc are really full versions from the previous year or a little older, whereas those with the year appended seem to be lite versions with some features missing. I noted that when I compared Ashampoo Snap 8 I bought a couple of years back to versions of Ashampoo 2017, which was much more recent having some key features I had like OCR of captured text missing. I think this feature is also not in Ashampoo Snap 2018. Ashampoo Snap 8 & in fact 9 have been offered as Giveaways, not sure whether here, but certainly on other Giveaway sites and are a better deal. I recently replaced Snap 8 (bought) with Snap 9, a Giveaway, with all 6 superior performance. So my feeling is if you look at ALL features of UnInstaller 6 and Uninstaller 2017, you might note that the former can do more. 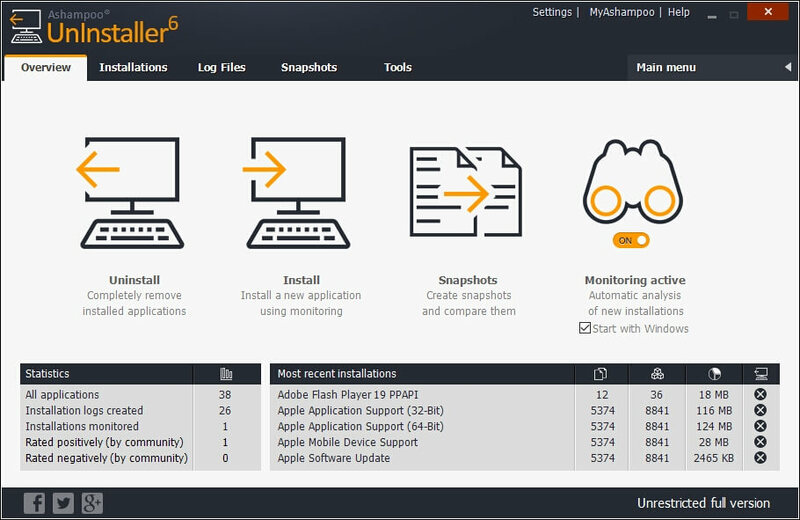 Andy, Not sure about "Uninstaller 2017", but I know for sure is that with other Ashampoo software like let me say Ashampoo Snap 8 or 7, compared to those with the year appended like Ashampoo Snap 2017 or 2018, Ashampoo Snap 8 or Ashampoo Uninstaller 6, etc are really full versions from the previous year or a little older, whereas those with the year appended seem to be lite versions with some features missing. I noted that when I compared Ashampoo Snap 8 I bought a couple of years back to versions of Ashampoo 2017, which was much more recent having some key features I had like OCR of captured text missing. I think this feature is also not in Ashampoo Snap 2018. Ashampoo Snap 8 & in fact 9 have been offered as Giveaways, not sure whether here, but certainly on other Giveaway sites and are a better deal. I recently replaced Snap 8 (bought) with Snap 9, a Giveaway, with all 6 superior performance. So my feeling is if you look at ALL features of UnInstaller 6 and Uninstaller 2017, you might note that the former can do more. Andy, I have 2017, Andy..the difference looks like Uninstaller 6 shows that it will monitor installs, should you wish, where as 2017 showed no such allowance. Andy, I received this ad from Ashampoo stating new fonctions within Uninstaller 6 vs 2017 : Uninstall nested configurations Create a log of installations made from the Web and uninstall them Trace all system changes through snapshots Improved installation monitoring Uninstall multiple apps at once Apps rated by UnInstaller community Etc. What is the differences between Ashampoo Uninstaller 6 and this FREE FULL version Ashampoo 2017 beside that little tiny icon on the top? jhava, As in my reply to Andy, it looks as thou you can turn on and off an install monitor in Uninstaller 6. I have WinOptimizer 15 which has an uninstaller. Would this be a better uninstaller? Celmo, I have Winoptimizer 15 also and have used Ashampoo Uninstaller in the past. This is way better than the built in uninstaller in Winoptimizer 15 because you can trace the installation of softwares to completely remove them if you choose to do so later. The uninstaller in Winoptimizer 15 is just a basic uninstaller no better than Windows built in uninstaller. One thing you have to be very careful with when using this or any other uninstall software that traces the installation, you need to make sure only Ashampoo uninstaller and the software you are installing is THE ONLY THINGS RUNNING until the installation and monitoring is finished. Because if you don't and run other things in the background it can include that as part of the installation that is being monitored, so when you go to uninstall that traced software it could uninstall other things that were running at the time of traced install. I would recommend that you do not leave the real time monitoring on all the time, instead use the monitoring on demand as needed, right click on the software and select to monitor the installation that way. I currently have a license for Revo Pro and am using it, and I have to say that honestly Ashampoo Uninstaller versions 5 or 6 works just as well. One thing Revo Pro does that I do not like is when you go to install a software and that software finishes and opens your browser sending you to the developers website which happens in a lot of softwares, in my case my browser is Google Chrome, it will monitor Chrome being opened so if I uninstall that software without being careful to uncheck where it monitored Chrome it will delete my browsing settings. Ashampoo Uninstaller 6 will do the same thing. I do however use Sync with Google Chrome so a quick fix for me is to just sign back in and it's all back. So if you use Google Chrome and sync, that's an easy way to resolve that issue. Celmo, I have Winoptimizer 15 also and have used Ashampoo Uninstaller in the past. This is way better than the built in uninstaller in Winoptimizer 15 because you can trace the installation of softwares to completely remove them if you choose to do so later. The uninstaller in Winoptimizer 15 is just a basic uninstaller no better than Windows built in uninstaller. One thing you have to be very careful with when using this or any other uninstall software that traces the installation, you need to make sure only Ashampoo uninstaller and the software you are installing is THE ONLY THINGS RUNNING until the installation and monitoring is finished. Because if you don't and run other things in the background it can include that as part of the installation that is being monitored, so when you go to uninstall that traced software it could uninstall other things that were running at the time of traced install. I would recommend that you do not leave the real time monitoring on all the time, instead use the monitoring on demand as needed, right click on the software and select to monitor the installation that way. I currently have a license for Revo Pro and am using it, and I have to say that honestly Ashampoo Uninstaller versions 5 or 6 works just as well. One thing Revo Pro does that I do not like is when you go to install a software and that software finishes and opens your browser sending you to the developers website which happens in a lot of softwares, in my case my browser is Google Chrome, it will monitor Chrome being opened so if I uninstall that software without being careful to uncheck where it monitored Chrome it will delete my browsing settings. Ashampoo Uninstaller 6 will do the same thing. I do however use Sync with Google Chrome so a quick fix for me is to just sign back in and it's all back. So if you use Google Chrome and sync, that's an easy way to resolve that issue. Hope this helps. Good luck! Rob, I've been using Uninstaller 7 for some time now, and I'm familiar with the phenomenon you reference. I've never had this happen with a browser open at the time of install, but two programs (a media suite with multiple modules, perhaps, in which you install the modules at separate times) can become "entangled", for lack of a better word. In that case, the program will warn you that uninstalling the one will result in the uninstallation of the other. The workaround is to use the module's built in uninstaller, then scan for left over fragments. One inviolable rule is always (always!!!) turn off your virus program's shields before installing anything. Before I realized this, Avast corrupted a half dozen attempted installations. Rob, I've been using Uninstaller 7 for some time now, and I'm familiar with the phenomenon you reference. I've never had this happen with a browser open at the time of install, but two programs (a media suite with multiple modules, perhaps, in which you install the modules at separate times) can become "entangled", for lack of a better word. In that case, the program will warn you that uninstalling the one will result in the uninstallation of the other. The workaround is to use the module's built in uninstaller, then scan for left over fragments. One inviolable rule is always (always!!!) turn off your virus program's shields before installing anything. Before I realized this, Avast corrupted a half dozen attempted installations. I see my question is being downvoted. How can one ask a question without getting such a reaction? Is it not expected that we should be able to ask questions? Rob, I also use Revo Pro and find it useful. Not great, but much better than Win10 built in uninstall. One feature i like about it is that it creates a restore point and registry copy before uninstall process starts. Comes in handy if you mess up big time during uninstall - never happened so far, but you never know. One thing I hate about Ashampoo software is the amount of email you get on the free versions and offers to upgrade to paid version every time you use the software. Rob, I also use Revo Pro and find it useful. Not great, but much better than Win10 built in uninstall. One feature i like about it is that it creates a restore point and registry copy before uninstall process starts. Comes in handy if you mess up big time during uninstall - never happened so far, but you never know. One thing I hate about Ashampoo software is the amount of email you get on the free versions and offers to upgrade to paid version every time you use the software. celmo: If you don't ask, you never know. So don't worry about down votes. They're from people you'll never meet, and wouldn't want to be bothered with even if you did: simple button pushers and icon clickers with nothing to contribute. Your question, like that of the poster at #9, is perfectly valid because there's a plethora of uninstallers out there and folks on here could well have experience of 'em. This nice offer of commercial software from Ashampoo as a GOTD of the day, and the always free Geek -- and then compare them, see what you think and how they stack up against your existing uninstaller. celmo: If you don't ask, you never know. So don't worry about down votes. They're from people you'll never meet, and wouldn't want to be bothered with even if you did: simple button pushers and icon clickers with nothing to contribute. Your question, like that of the poster at #9, is perfectly valid because there's a plethora of uninstallers out there and folks on here could well have experience of 'em. I like Revo Pro, most likely because I bought it, and as it's worked fine for me all these years, I'm not inclined to try any commercial rival. That said: I do also have an excellent freeware alternative on this machine, Thomas Keen's Geek: <b>https://geekuninstaller.com/</b> It's fast, light, small, simple, and reliable. Whether it's in the same league as the Ashampoo product, I've no idea, so if you're working to a tight budget then I'd recommend you make two downloads today: This nice offer of commercial software from Ashampoo as a GOTD of the day, and the always free Geek -- and then compare them, see what you think and how they stack up against your existing uninstaller. it helps not to be bothered by such actions which I have also noted and do not make any sense whatsoever. I'm sure the folks who do that probably have nothing constructive to contribute and feel they have to click something. Just ignore them and ask your questions, which someone, soon or later will respond to. 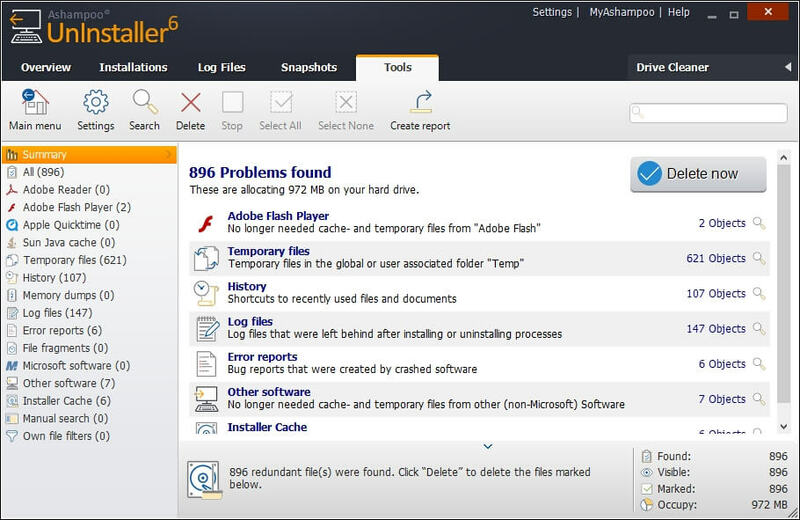 I have not used WinOptimizer 15, but what the first responder says makes sense. I am trying out Ashampoo uninstaller 6 & it looks good. I have otherwise used iObit uninstaller (both free & pro Giveaways) which are both OK.
celmo, it helps not to be bothered by such actions which I have also noted and do not make any sense whatsoever. I'm sure the folks who do that probably have nothing constructive to contribute and feel they have to click something. Just ignore them and ask your questions, which someone, soon or later will respond to. I have not used WinOptimizer 15, but what the first responder says makes sense. 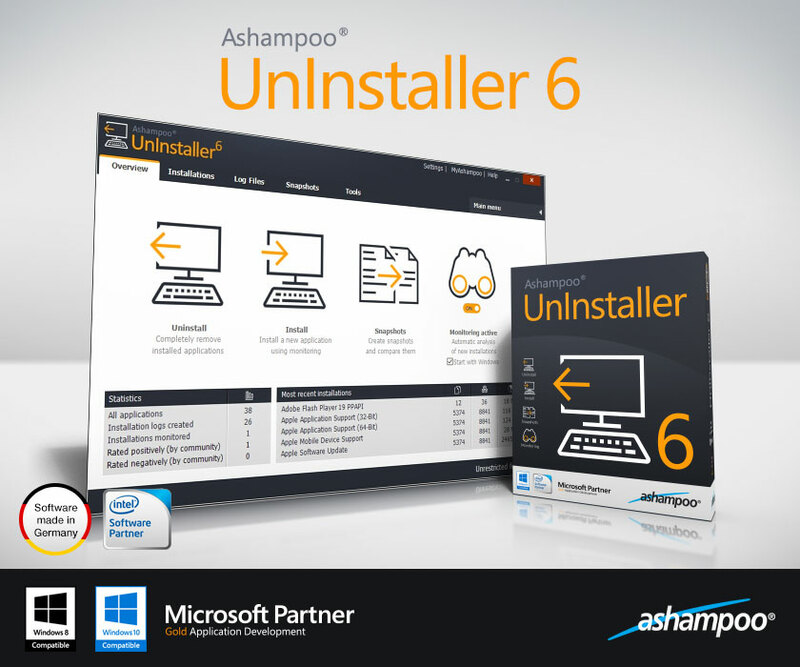 I am trying out Ashampoo uninstaller 6 & it looks good. I have otherwise used iObit uninstaller (both free & pro Giveaways) which are both OK.
celmo, I agree with xprt. These markers do not usually work properly. Sometimes you press Yes or No and nothing happens, but the blue goes and you cannot vote at all. Other times, whichever you press, it goes two at a time, i.e. if there are 5 yeses and you press yes you get seven! So take xprt seriously and good luck. I have used Ashampoo products for years and have never had a problem. If you are not sure you have an account, why not use another email & just register anew? You can always use the same account for years. 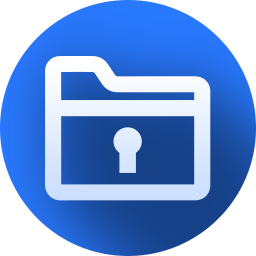 The instructions in the unzipped Giveaway read me file "To activate your free copy request the registration key by pressing "Get free activation key" button in the program window. Fill in the form on the pop-up page using your Ashampoo account email, and the registration key will appear on the same page. " This pop-up come when you run the only other file in the unzipped download "Setup".Fill in the email address of your Ashampoo account. It cannot be any easier. For other Ashampoo Giveaways, use the same email. You can in fact always retrieve your key in your account if you ever need it again & have to re-install, assuming you have kept the exact version of the Ashampoo product. jpmalonesr, I have used Ashampoo products for years and have never had a problem. If you are not sure you have an account, why not use another email & just register anew? You can always use the same account for years. The instructions in the unzipped Giveaway read me file "To activate your free copy request the registration key by pressing "Get free activation key" button in the program window. Fill in the form on the pop-up page using your Ashampoo account email, and the registration key will appear on the same page. " This pop-up come when you run the only other file in the unzipped download "Setup".Fill in the email address of your Ashampoo account. It cannot be any easier. For other Ashampoo Giveaways, use the same email. You can in fact always retrieve your key in your account if you ever need it again & have to re-install, assuming you have kept the exact version of the Ashampoo product. jpmalonesr, After you downloaded the software, opened it, hit extract all, then clicked setup in the newly opened window, didn't a box pop up that said "Get Activation Licence"?..clicking on that takes you to the Ashampoo website and if you had an Ashampoo account, it will notify you. If not, you can set 1 up there. uncheck any checked newsletters. You are done, no emails will be sent to you. When booting the PC you still will get a nag screen with an offer though just click it away. This happens with all their software regardless if it is free or paid. hi is this a 12 month licence ? Tony, CHIP is a German computer site that is known to give away freebies as well similar to gotd and they have often Ashampoo software. another notable site with freebies and darn good deals would be sharewareonsale. Personally these are the only freebie sites that have never given me any issues. can you pls elaborate 'back up the setup' - i.e. how do you back up setup? He probably means that you should back up your reinstall-able applications and their licenses to an external hard drive, the way I am doing it, so in case of a computer crash you are still able to (re)install those programs. This is exactly what I like about Ashampoo: you can easily reinstall their giveaways by using their setup file backed up to your own storage (=on your external hard drive), or by accessing your account (with Ashampoo) where your downloads and registration keys are held forever, provided that you use a real email on signing up to Ashampoo. consuella, ty Consuella, yes that is exactly what I mean. I thought Giveaway progs can only installed on the day it was given. consuella, Thank you so much! I thought Giveaway progs can only installed on the day it was given. Many thanks!